The Wyoming Valley Youth Soccer League (WVYSL) exists to foster and perpetuate the game of soccer where fair play and proper sporting behavior will be displayed at all times. The following will be the rules and regulations governing team play in the Wyoming Valley Youth Soccer League for the age groups U-6 (under six) through U-18 (under eighteen). The following clubs are members of the Wyoming Valley Youth Soccer League and agree to abide by the following rules: BACK MOUNTAIN, BEAR CREEK, COSMOS, FORTY FORT, HANOVER, KINGSTON, MOUNTAINTOP, NANTICOKE, PLAINS, WEST SIDE UNITED, SKYHAWKS, PITTSTON, and TRIBORO. The laws of the game will be governed by the FIFA rule book except where modified herein. 1. The designated home team (club) in any game is responsible for the preparation of the field before that game. The field should be distinctly lined and goal nets should be provided. Corner flags should be provided where possible. 2. All lines should be adjusted appropriately for downsized fields. All coaches and substitute players must remain within the designated area. 4. Teams and players are to be positioned on one side of the playing field and spectators / parents must be positioned on the opposite side of the field when possible to be enforced by the coaches. 1. All players must be properly registered through EPYSA and must be registered on that team's roster. 3. Every rostered player present must play a minimum of half the game. 4. A maximum of 50% of rostered players on a team may be "carded" travel players. A. WVYSL will contact the club president of the accused player to obtain a birth certificate prior to the next scheduled game. If the player is found playing in a younger age group the club will be fined $100 and the player will be ineligible to play. B. Ifteamcontinuestoplaythisplayertheentireteamwillberemovedfromthe schedule / league. 6. If an injured player(s) is (are) attended to on the field, injured player(s) must leave the field. A substitute may enter for the injured player(s) and the opponents may substitute an equal number of players. The injured player(s) may return to the field on a throw in by their team, during a goal kick by either team, or after a goal is scored by either team. The referee must be notified before the injured player(s) may return. The use of shin guards is mandatory. Shirts must be tucked into shorts. any type are allowed. Shoes determined to be unsafe by the referee cannot be worn. 5. No rings, earrings, necklaces, bracelets, or jewelry as well as hard hair clips will be allowed. Eyeglasses and medical alert bracelets will be permitted however these bracelets must be taped to players' wrist. 6. The designated home team is responsible for providing two (2) suitable game balls for each game. 7. Coaches should carry ice packs as well as emergency contact information during game day. 8. Intheeventthattwoteamsarewearingsimilaruniforms,theteamwearingcolorsnot previously registered with the Wyoming Valley Youth Soccer League must provide alternate colored jerseys/pennies during game day. 1. All WVYSA recreational games do not require USSF certified Assignors and Referees. Games may be refereed in a 1 or 3 man ref system following a Diagonal System of Control. preference should always been given to unregistered club linespersons who have no affiliation to the participating teams. 2. During U-12 and up it is mandatory to have a minimum of two referees and a club linesman. 3. The officials of the game must be at least two years older than the level that he/she is officiating. 4. If an injured player(s) is (are) attended to on the field, injured player(s) must leave the field. A substitute may enter for the injured player(s) and the opponents may substitute an equal number of players. The injured player(s) may return to the field on a throw in by their team, during a goal kick by either team, or after a goal is scored by either team. The referee must be notified before the injured player(s) may return. 1. All players, coaches, parents, spectators, etc. are expected to demonstrate proper sporting behavior at all times. Reference the Wyoming Valley Soccer League Code of Conduct. Refer to page 10. 2. Eachteam'scoachesareresponsibleforinsuringthattheirteam'sparents,spectators,etc. follow the rules of conduct and that the rule regarding the spectator line is followed. 3. Coaches and players must stay in the coaching box when provided. When no box is provided, coaches and players will remain between two yards of the midfield line, two yards off of the touchline and extending to the frontline of that fields penalty area on their respective half. Once sides are established coaches and players must remain within their team box unless substitutes are waiting to sub at half. There is absolutely no coaching from behind either goal or spectator side. 4. Ifcomplaintsarereceivedbyaclubofficialonly,AWyomingValleyYouthSoccerLeague sanctioned representative picked by the league will be sent weekly to evaluate games with complaints against coaches/parents. This Wyoming Valley official has the right to enter the field of play any time at his or her discretion to advise the official. 5. If a yellow card is given, a player (U7-10) must be substituted and can return at the beginning of the next quarter; (U11-18) can return at the next stoppage his/her teams advantage. 1. Intheeventthattwoteamsarewearingsimilaruniforms,theteamwearingcolorsnot previously registered with the Wyoming Valley Youth Soccer League must provide alternate colored jerseys/pennies during game day. 2. When a clubs fields are closed due to weather conditions, 2 hour notification of closure to club presidents before game time is required. 3. If a team is unable to roster the minimum number of players, the club president and opposing coach are required to be notified by 9:00pm on the Thursday prior to the scheduled game. A. In the event a team does not attend a scheduled Wyoming Valley League game and the opposing team is not notified the absent team's parent club will be assessed the Referee fees for the missed game made payable to WVYSA or the Home field club, whomever is ultimately paying the Referees. B. The team that did not show is responsible for scheduling the make-up game. If they do not make an attempt to re-schedule the game that team's parent club could be required to pay a $50.00 fine made payable to the opposing club at the opposing club's request. 5. A maximum of three coaches are allowed on the sidelines during a game. Coaches are to be situated in the coaching area (half-way line to the top of the penalty area in their own half). All coaches must have completed the risk management form. No coaches, parents, or spectators are allowed directly behind goal line. 6. Any player exhibiting symptoms of a concussion shall not return to the field until cleared by an appropriate health care professional. It is the coach/club's responsibility to determine a player's fitness to return. 1. Newspaper articles, internet articles and social media promoting youth soccer or publicizing intramural teams will be permitted, provided team scores, records and / or standings are not included. The offending club breaking this rule will be fined $25.00 for each offense. 1. 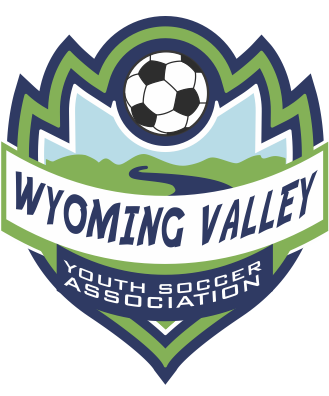 The Board of Directors; which includes the elected officers and club representatives of the WVYSL, reserves the right to take whatever action it feels may be necessary to correct any violation of the rules and regulations to ensure continued success of the soccer program for the youth of Wyoming Valley. 1. Start of Play-All players must be in their own half of the field with one team kicking off. Opponents must remain outside the center circle until the ball is played. Before the game decide who will kick off to begin the game and then change the kick off team at the beginning of each quarter. Kickoff is intended to ensure possession and can be kicked in any direction, including backwards. 2. Ball In and Out of Play-When the WHOLE of the ball goes over the WHOLE of a boundary line, the ball is out of play. 3. Method of Scoring-A goal is scored when the WHOLE of the ball goes over the WHOLE of the part of the goal line defined by the cones or actual goal. Scoring goals is possibly the MOST fun a soccer player has during a game. Give players every opportunity to score a goal. 4. Goal Kick-If the team attempting to score a goal kicks the ball over the goal line outside the goal posts, the opposing team puts the ball back into play with a goal kick. The kick should be taken within the goal area and opposing players must remain outside of the penalty area until the ball is in play. 5. Corner Kick-Use an indirect free kick with the opponent 5 yards (10 yards U-11 and up; becomes a direct kick) away. If the team defending against a goal being scored kicks the ball over the goal line outside the goal posts, the opposing team puts the ball back into play with a corner kick. 6. Heading - Intentional heading is a foul for U11 and under. If the offensive team intentionally heads the ball, the opposing team will receive an indirect kick at the point where the heading took place. If the foul occurs in the defensive penalty box an indirect free kick shall be awarded at a point nearest the foul outside the penalty box. 1. For U7 and U8 where no direct kicks or penalty kicks are awarded. fouls within the penalty area which will result in a penalty kick.